First things first: just dig into this advertisement. Well, did you enjoy the drama? It was worth watching, isn’t it? This show, this charade put up by the channel is called a ‘spectacle’, a public performance that impresses and is awe inspiring. One thing to come out of this ad: actually, this is what television channels do, this is the kind of drama that is mixed up them and served to us, isn’t it? 1. a. Something that can be seen or viewed, especially something of a remarkable or impressive nature. b. A public performance or display, especially one on a large or lavish scale. c. A regrettable public display, as of bad behavior: drank too much and made a spectacle of himself. a. A pair of eyeglasses. b. Something resembling eyeglasses in shape or suggesting them in function. 1. It is important for a performer to put up a spectacle for his fans. 2. All too often, we indulge in creating spectacles for the public and forget what we really wish to do. 3. Spectacles involving film-stars can garner a lot of media attention and therefore, are used by companies for promoting their brands. 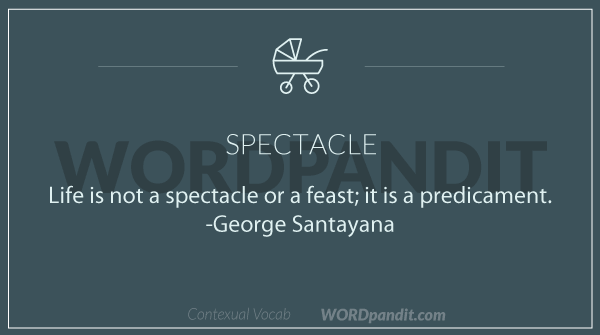 Spectacle can represent two extremes, that is an extremely good performance or an extremely bad one, depending on the context.